Joslyn is using Smore newsletters to spread the word online. 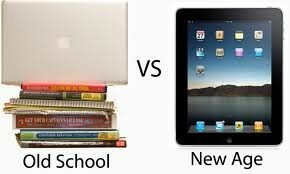 The typical "old school" classroom vs. the "new age" classroom shows that iPads are the new classroom. iPads in the classroom can help engage students and their learning! Teachers can begin using iPads in their classroom at any age! Watch this Youtube video to learn about the top ways to incorporate technology in education. Using technology helps students learn more than just the content area given in the classroom! The website, http://www.inkids.com.au/2013/03/17-benefits-of-ipads-in-classrooms/, shows readers the many advantages of using iPads in the classroom. This website clearly lists how the iPad can be seen as a "versailte, powerful tool that is changing the face of education." Saving money by combining books, diaries, writing implements, calculators, word processors, etc. all in one media tablet. Allowing students to take control of their own learning. The touch-screen interface allows students to engage more interactively with content. Education programs can be tailor made for each student. Wi-Fi and 3/4G connectivity allow for almost instantaneous and continuous access of information. The ability to quickly switch between applications makes it easier for students to switch between different modes of learning (i.e. research and creation). Mobile data collection is generally streamlined and easy. The iPad easily integrates with existing IT systems. With cloud-based computing, students have connectivity anywhere within the school grounds. There is no need for schools to continue to allocate large budgets for computer power that is no longer necessary. School districts have been creative in finding ways to save money using the iPad. From digital textbooks, to tests and to homework, there’s the potential to save huge amounts of money through paperless innovation. iPads are accessible to students with disabilities. Apps are available for children with cognitive learning problems and there are also accessibility tools built into the latest iOS such as Speak Auto-Text, White on Black, VoiceOver and Siri, a voice recognition technology. The iPad can easily be positioned for comfortable use on your desk or lap. Students can also purchase cases and stands which allow devices to be propped up at an appropriate viewing and typing angle. The iPad can also be paired with an external keyboard to ease and speed up typing. There is no delay to boot up iPads like there is with netbooks or laptops, and no time lost figuring out complex software applications. The iPad’s intuitive design and easy-to-use interface makes it simple for even young children to navigate, thereby optimizing the learning experience of all students. The App Store/iTunes Store offers a vast amount of free or low cost apps, many of which are excellent for the classroom. Its light weight and portability means it can easily be carried from class to class without having to close and reopen the screen. Data can be accessed while standing and notes can be taken on the go, thus extending learning far beyond the classroom. It has far less of a strain on children’s backs since one iPad replaces a bag full of books. Children are eager to embrace new technology and many are able to troubleshoot computer issues and resolve them quicker than adults. The blog, IT Solutions Blog points out in the article, 5 Smart ways to use iPad technology in the classroom, that a teacher can use iPad to: display teacher and student work, create instructional content, interact with students, personalize learning, and manage the classroom. This YouTube video is very helpful for current or future teachers looking for apps that they can incorporate into their classroom when using iPads. It shows the many benefits of technology in the classroom! 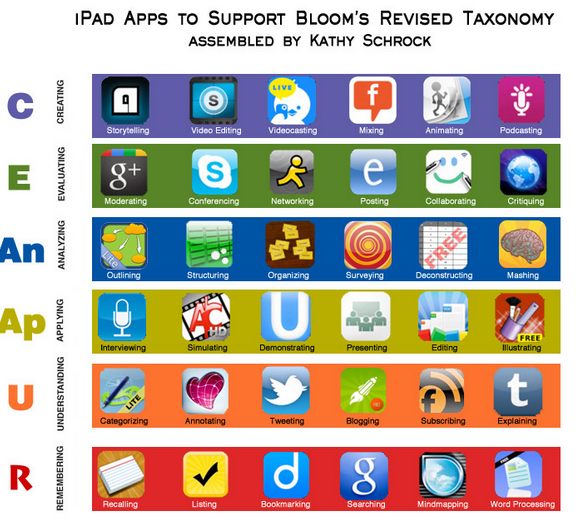 Did you know how many apps can be used in the classroom that coincide with Bloom's Taxonomy? Check out the picture and website for ways to use it in your classroom! Check out the YouTube video, iPads in the English Classroom, to find ways that you can improve your classroom with technology! More Resources for iPads in the Classroom! Apple: Apple wants their product to be used for educational purposes. Their website shows the many features and uses it can provide in that context. iPads for Learning: This website provides different apps for iPads in the classroom as well as reasons why the iPad is a great teaching strategy to be used in the classroom. Ipadschools: Managing a classroom full of students and their iPads can be tough. This website shows how to effectively manage your classroom and technology. I have iPads in the Classroom. Now what? What can you do with the iPads in your classroom. How can they improve your teaching and student learning? Check the slideshow out for more answers! iPads in Education: While exploring the use of iPads and eBooks in schools and colleges, the website provides discussion, videos, and tips for using iPads. 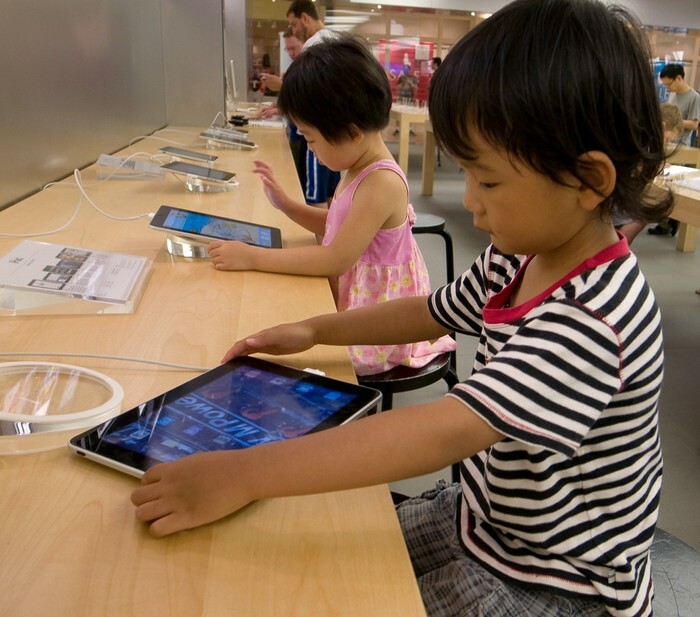 Edudemic: Reasons why we should use iPads in the classroom (not how)!